Rasgueado strums represent the backbone of many Mediterranean and Latin American folk styles, and they’re found throughout the modern classical repertoire from Joaquin Turina to Magnus Lindberg. Because of their reliance on extensor muscles, rasgueados also make for an excellent practice tool, even if you’re not trying to incorporate them in your playing otherwise. The rasgueado originates its striking force as a flicking gesture of the finger, wrist, elbow, or, most often, a combination of the above. I think of this motion as much more “explosive” and instantaneous than the regular plucking one. For finger flicks, I find “cocking” the fingers against the heel of my hand most useful—allowing the fingernails to dig into my palm a tiny bit. For flicks originating from the wrist or the elbow, I let the weight of the hand do most of the work. I should also point out that wrist and elbow flicks are akin to the “rotating” motion one does when turning a door knob, only “looser”. Most flamenco books teach rasgueados as going from pinky to index. An often overlooked problem with this approach is that not everyone’s hand is “wired” to unfurl the fingers in that order. Mine most certainly is not: I can fan my fingers open much faster and more seamlessly if I go from index to pinky—and that’s true with both of my hands. To find the way your hand “likes” to open, simply rap your fingers on a table-top, starting from a closed-fist position. Try both ways (pinky-to-index vs. index-to-pinky), and you should find one of them to be much more natural. Below are some of my favorite finger-strumming patterns, but in this case the sky’s the limit—nothing really keeps you from discovering what works for your hands. The nomenclature reflects the conventional one; however, I’m introducing the letter “h” to mean any combination of fingers (hand-strum). 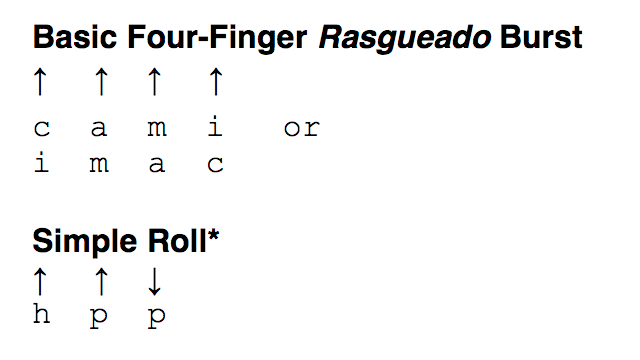 Generally speaking, rasgueado patterns can be divided into bursts (quick sequence of finger strums used as an accenting devise) and rolls (sequences that can be looped indefinitely). You should strive to learning a couple of useful patterns for each category. In terms of rolls, I would suggest you eventually build your own: you can do so easily by dividing each roll into sets of motions that allows for some time to recoil in between. In other words, you don’t want to use the same finger twice in a row, or go back to a finger that hasn’t had a chance to recoil to a “ready to strike” position. Also, notice how some use the whole hand as a “big finger”, integrating wrist- and elbow motions into the roll to enhance fluidity and seamlessness. Finally, I should point out that downstrokes (towards the floor) are marked with up-arrows, for consistency with sheet music notation (towards the “high” treble string). As with every new technique, practice slowly and take frequent breaks. Your extensor muscles might be a bit underdeveloped if you haven’t spent a lot of time practicing these sorts of motions before, but if you incorporate some rasgueados in your daily practice routing you’ll soon see the results of this new technique in all aspects of your playing. *note: the two consecutive downstrokes are obtained by combining the outward flicking of the fingers with a forearm rotation; returning the forearm to the normal position will yield the thumb upstroke. **note: return all fingers to a coiled position as you do the upstroke with p.
*note: this one’s tricky. Start with all fingers coiled. Flick i out, then, as you flick c out, recoil i. Unfold each successive fingers. When you loop back to flick i out again, recoil all remaining fingers at once. Personally I find this particular rasgueado quite awkward to pull off, but it’s one of the most widely-taught patterns. That was a very informative breakdown of Rasgueados…it’s a technique I don’t use too often, but I found the thoughts about the different ways peoples’ hands open naturally to be kind of fresh (perhaps obvious, but not something I had thought of). Thanks! Great post. I’d recommend to anyone including 3 or 4 minutes a day of rasqueado exercises while working on technique. After incorporating these in to your “workout” , you will notice a huge difference when playing scales. by guitarists . Tremolo and scale technique will improve vastly by it’s inclusion to your practice.